Lily Melrose - UK Style and Fashion Blog: What Would Alexa Do? such a sweet outfit. wish i could pull denmin dungaree's off! Love the feature, the outfit and River Island! Haha <3 Great post! Great outfit! those shoes are beautiful! I've been wondering who can really pull off that style dress! And the answer is obviously you! Love how you accessorized it! You look great, as per usual! Love your pinafore! Wish I could get away with one, but with my bust I always look like a slutty schoolgirl in anything like this! Either that or an Oompa lumpa. Anyway, it looks gorgeous on you! 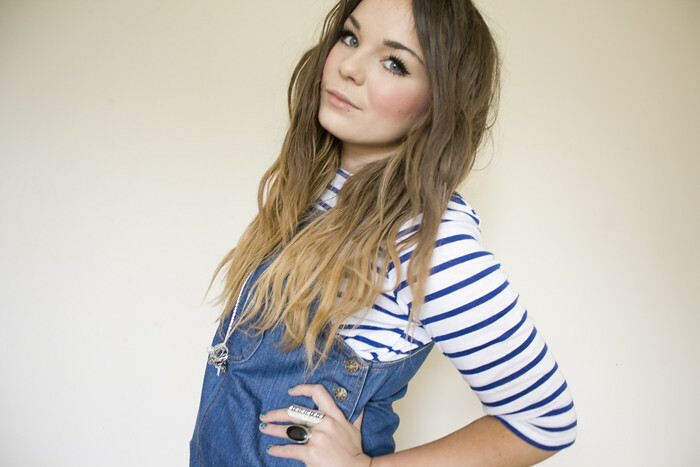 Dungarees + nautical top = super cute. You are such a doll, and such fantastic feature! You are my style Icon!!! Love this, stripes and denim are always a winner! I think I need a long sleeved stripe top :) And the shoes! What a great feature! I really love when people talk about their inspiration for a certain outfit! and i love the shoes too! love the leopard print nails you done! That's so cool! I love this denim dress!! Also I suggest you go see Fast and Furious 5 (make sure you've seen the previous ones except Tokio Drift cause that's meant to chronologically come after this one or if they make a sixth one) PAUL WALKER'S FACE IS AMAZING. wow. convince them to ship worldwide! this would be amazing! i am really into stripes and jeans. i think its easy and works really well. dont make us wait to long for the new outfit!!! I love your hair in these photos!